Why do you need SSD? What you should know about SSD? There is no better way to speed up or upgrade computer than to replace mechanical hard drive with a solid state drive, or SSD for short. You just bought in a brand new SSD and plan to place it into your computer. But the trouble of having to reinstall operating system and programs lingers on you. If you do not want handle these tedious operations such as back up all personal files, add the new drive, install OS and programs on it and set everything to the way it was, you can simply follow this guide here and have your HDD cloned. This article introduces how to clone HDD to SSD as well as SSD-related knowledge. SSDs are slowly but surely taking the place of hard drive and becoming the primary storage devices. There are many good reasons that users would like to adding a new SSD or upgrading computer with SSD. The most remarkable advantage of SSD is that it is about five times faster than a hard drive. If Windows runs on SSD, operating system, installed programs, games, etc. will start quite faster and computer feels very snappy. Another thing that holds you back from SSD might be the price tag. SSD is far more expensive when compared in cost per gigabyte of regular hard drives. A few users are not willing to pay hundreds of dollars to improve computer speed in exchange for less storage space and higher price. However, an increasing number of laptops manufactured with SSDs by default. SSD price continues to drop and capacity increases gradually. SDD will be widely adopted in computer in near future and you won't refuse a storage which is more reliable and faster. To maintain this article on a level that all readers can understand, we'll try to explain everything in a straightforward way. Hard disk drive or HDD for short is the basic and traditional storage device in computer, which is as important as human being's brain, as it stores all important data for users. HDD is composed of a number of moving parts, which leads to that it is easy to get damaged due to knocking or striking. However, it provides huge and various storage capacity, for example, 500GB, 1TB, 2TB, 4TB, etc. It can be produced in different sizes such as 2.5 inch, 3.5 inch, etc. The most common size for laptop is 2.5 inch and the 3.5 inch HDD is mainly used in desktop. The larger size can contain more platters inside and thus provides more capacity. The advantage of an HDD is that it is able to store lots of data with low cost. For now, 1TB (1,024 GB) hard drive is quite common for a laptop and the capacity continues to increase. Whereas, the cost per gigabyte can't be calculated to an exact number, as there are so many factors to consider, but it's safe to say that the price of hard drives is much lower than SSD. A simple comparison is made here: a 1TB WD Black HDD usually goes for $70 on most of website shops, while 1TB SSD goes for roughly $400 which is over 5 times the price of HDD. SSD stands for Solid State Drive, but you might be wondering what SSD means. You must have used USB flash drives or memory sticks, and you can regard SSD as the oversized and complicated version of USB flash drive or memory stick. That's because none of them has moving parts; what's more, files are stored on microchips. On the contrary, hard drive reads or writes data with the help of a mechanical arm with a head moving over rotating platters. That's the reason why SSD is much faster. Sill puzzled? You'll be able to easily say which one is quicker in this analogy: walking across the room the get newspaper and read news or simply having that newspaper already in your hand to read it. SSD doesn't need mechanical moves to read or write data, so it's faster and quieter. The appearance and interface of SSD is actually the same as a regular hard drive. It produced in standard 2.5 or 3.5 inch size, so that it can be used without any size issue. The connector of SSD is mainly SATA, but smaller SSDs are available too, for example mSATA (mini-SATA) which fits into mini-PCI Express slot of laptop. In the past years, SSD has increasingly gained popularity around the world. If you are using or going to buy an SSD in order to upgrade computer, you may probably learn a little about TRIM which is quite important to SSD. To figure out why TRIM matters so much, we should know how SSD works and processes data first. The previous part has mentioned that a solid state drive consists of flash memory chips and it has to deal with these chips to read or write data. Files stored on SSD are put in blocks which are further divided into pages of data, which is similarly to a library. There are many shelves which stores many books. But when you delete a file from SSD, operations won't be as easily as simply take a book from a shelf. When some data gets deleted, the entire block containing the page will be deleted even though deleted data occupies only one page from the block. All data on other pages will be moved to cache and then put back to original block. Thus the deleting action is like remove all books from the shelf if you want to take out a book, and then you have to put other books back. Quick simply, SSD has to wipe data complete if it writes new data on a previously used space. Such operations will be dome every time when users move or delete files from SSD. Thus, it's not effective at all. It is because of this that TRIM is used on SSD to improve performance. TRIM is a command that allows system to tell SSD controller which blocks of data are no longer in use and can be deleted for good. Then SSD becomes able to access only pages that contain data. What's more, no matter when deletion is done by users, the TRIM command will erases pages holding that data immediately. That way, operating system won't have to wait to delete data first when it tries to write new data in the future. Without TRIM command, when rewriting files, SSD would have to move large amount of data, wipe out all blocks holding it, and write new data. TRIM command frees SSD from constantly wiping and rewriting data and enables SSD to directly access pages instead of blocks. Besides, TRIM command guarantees a faster speed and better performance. 4K alignment means that hard drive is formatted in line with "4K sector" definition. Then files are stored on this drive following "4K sector" rule. 4K alignment is quite important to SSD, as it boosts speed as well as avoids unnecessary read/write actions. It is well known that 512-byte sector is extensively used on standard hard drives. Nevertheless, the capacity of hard drive grows over years, 512-byte sector is no longer able to meet higher demand, and hard drive manufacturers produce hard drives with 4K (4096 byte) sector. To guarantee compatibility with system, manufacturers simulates 4K sector to eight 512-byte sectors. Thus there will be the case that 4K sector doesn't align with 4K cluster. The default cluster size of NTFS partition is 4096 byte (4K). Cluster is the smallest logical amount of disk space to hold data. Clusters on hard drives are not necessarily contiguous and they might be on different track cylinders. Cluster is set by system instead of disk producer. Therefore, the concept "4K alignment" comes up, namely align physical partition with system logical partition to improve read/write efficiency. See the picture below displaying 4K unaligned case. If disk is 4K misaligned, read data in one cluster will read two physical 4K sectors. The read and write speed slows down a lot. So it's very necessary to make SSD 4K aligned to get best performance. How do we know whether partitions are 4K aligned? 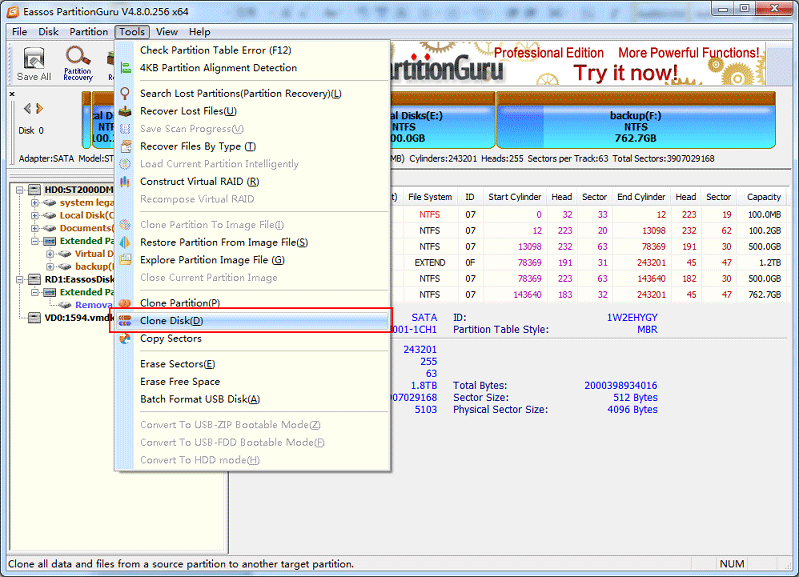 You can use free partition manger –PartitionGuru Fee to check 4K alignment for disk or partition. After the program is installed and launched, you can click "Tools" from menu and select "4K Partition Alignment Detection". Then a window will pop up to show alignment information. If your partition or disk is not 4K aligned, you can create partition with system built-in tool in Windows 7 or higher Windows version, and partition will be formatted according to 4K alignment rule by default. If you are still using Windows XP, then you can use PartitionGuru to achieve 4K alignment. As to SSD capacity, the general view is that the bigger the better. However, SSDs are still expensive, so you can easily find many computers with SSDs that are in smaller capacities, such as 32GB, 64GB, 128GB and 256GB. For the moment, if you want to upgrade computer, the most cost-effective approach is choosing an SSD with 100GB around. Then you can use it as the boot device that installs operating system and frequently used software, and add another HDD to store personal data. In this way, your system and installed apps will work in a super-fast manner, for example, the system start-up time will decrease to a couple of seconds. Another thing to consider is whether storage needs increase over time. Storage devices can be kept in 5-10 years, and your storage needs will definitely increase over the years. For instance, files are becoming larger, programs needs more space to install, collections of photos and other data grows, etc. If you are among those, please think twice before selecting storage device, or choose an SSD with large capacity. Before starting disk cloning, we need to learn some terms related to disk cloning first, so that we won't get confused by the following steps. Clone: Cloning is the action of copying content from one storage device to another without changing anything. Clone is not only able to ensure files of source disk and target disk are the same, but also guarantee same physical location as they are in the source disk. For example, some clone requires that target disk is identical with source disk in sector level, so that users are able to perform data recovery from target drive. Source Disk: Source disk is the drive that contains data to be cloned to another storage device. Target/Destination Disk: The disk that will receive cloned content from the source disk. To clone HDD to SSD you should prepare 3 things. These three items you must have are in the following part. You might do extra actions based on actual hardware setup and demand. Obviously, you should prepare at least two drives, source disk and target disk. As the cloning will wipe data off target disk and store cloned data, thus you need to backup data of target disk if it contains files already. If the target is a new drive, then you can move to prepare next item. Disk cloning is not simply copy files from one drive and paste them to another disk, you need the help of a powerful cloning program to fulfill the task. PartitionGuru is a versatile tool that can recover lost data, resize partition as well clone disk. It's easy to handle even for beginners. As to those users who want to migrate operating system from HDD to SSD, you can try the feature "Clone Partition". After hard drives get ready, you should figure out how to connect them to computer in order to start cloning. If you are using desktop, you need to open the case and hook up the new drive to motherboard. While if your computer is laptop, you have to connect extra hard drive via USB port, thus hard drive or SSD should be put in a USB adapter. If you have all disks hooked up to computer and cloning software downloaded, we can start cloning following tutorials below. PartitionGuru makes the clone of hard drive or partition easy and you can clone HDD to SSD or any other disks. Please note that all data on the target disk will be wiped and overwritten after cloning. Thus you should make sure there are not important files on destination disk in advance. Launch PartitionGuru and click menu "Tools" to select "Clone Disk". On the pop-up window select source disk and target disk. Click "Start" and PartitionGuru will start cloning disk. Please do not close it until cloning completes. "This is about: http://www.eassos.com/how-to/how-to-clone-HDD-to-SSD.php As I Need an extra tool to connect the SSD to the USB entrance.... is it also porssible to clone the old HDD to an external HDD (which has a USB connection), then replace the HDD in the laptop with the SSD and then clone from the extrenal HDD to the new SSD? Probably not, but it would make things a looot easier, so I ask. Thank You, Ross"